I wake up to a dull, rainy morning. I wonder if it had been raining all night. A smallish water body at the far end of our apartment is looking bigger today and there are plenty of mini muddy pools dotting the lane in front of our gate. I'm in a hurry to fix the lunch, snack and dabbas for the kid and husband and as is my wont, the mind goes on a trip of its own. The hands mechanically chop, pull out and put back various spice containers, and scoop out the near exact measures of spices into the curry, broth, and sundry items that are being done, all simultaneously. I wonder about the little girl in the lovely book I read last night. How she finds her happiness even in the bleakest of situations. So many lessons for me to imbibe, I reckon. I'm distracted by the child and husband rushing to be ready in time. I'm annoyed at myself for waking up late. I'm trying to fasten my pace if it was even possible. My mind wanders off yet again. I'm disturbed by how I'm unable to gauge certain people and my relationship with them. One moment I'm positive that we share a healthy, malice-free regard for each other and at other moments I wonder if it's just me who can sense undercurrents of negative emotions. Some days our conversations smell of comfort, familiarity, and a pleasant warmth. Just as my perturbed mind seems pacified, I'm taken a bit aback at the coldness and closed connecting doors that stare at me from the other side. The icy path between us is thawed today only to get snowed under tomorrow. Maybe it's all in my mind though I ponder over whether it is possible to be your true self with everyone? We're very image-conscious people and worry much about how we are perceived by other people. We also share a different equation with every single person we come across in this lifetime. The equations may be similar at times but never exactly alike. Some of us organize our social structure drawing concentric circles around ourselves and re-grouping people known to us within those circles. We then gather the complex lump of our personality and create a variation of masks therefrom; similar yet dissimilar ones for every enclosed space within the social circles. As sophisticated beings, we also master the art of seamlessly donning the different masks as we venture in and out of our varied social zones. It's also likely that we have people in our innermost circle in whose company we can be completely free of any masks, baring our souls and yet have neither squirm in discomfort. I'm compelled to introspect about how I fare in comparison to my own analysis of human behavioural patten. I seem to have a transparent face that reflects off everything going on in my mind. Or so says the spouse. I try to convince myself that he's mistaken but deep down I'm frightened by this trait that's not entirely untrue. This is why I prefer writing to talking. I get the space and time to collect my thoughts and convey it truthfully but not hurtfully. I'm sometimes caught in relationships I'd rather not pursue but feel delicate to cut the strings ruthlessly. I dawdle and give feeble excuses to exclude myself out. At the same time, I wonder if I've become a sort of social recluse, fussy about who stays in my inner circles. Perhaps, I have also become adept at wearing masks, I conclude. 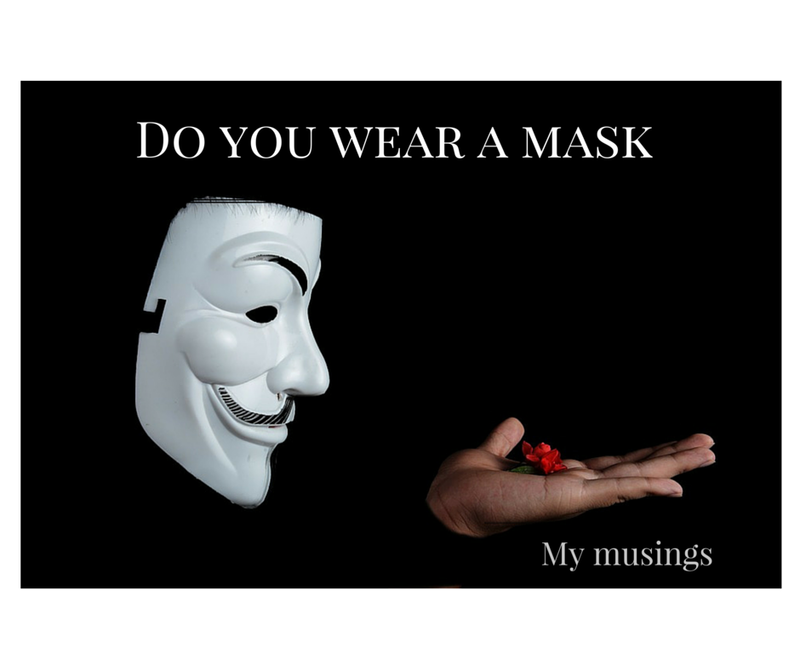 Have you pondered similarly about people and their masks? Do you wear one too? This post is really nice and i am getting some of related information about the relationship. Some of my relation are acting as real but he is really fake in my life. Taken more rights from me with my family. I don't like those people in my life. I cannot get the mind for asking the question to them. In this post is getting the quality sources and related information to me. I am also wearing mask as feel happy for all moment in my life. More people are possible to given the answer about this post. In your post is really nice and tells real words also. Thoughts are really nice and i am using different types of words and items for my family. I am taken more stress in my mind about my relations. I am getting some fo positive thoughts and feel unhappy in some days. My daughter is given happy to me. She is good friend for me and given wonderful ideas for my feels. She is really nice girl you know. My parents and my husband is also nice idea to given for my stress in my work. I am tell more actions and taken some solution for that. I am doing yoga in my home for reducing my angry. I want to share my emotions and what are the feelings are available in my mind. Some of people are taken my post for just like news. But it is my life. I should share the more information and related news in online. Did you want to know about my whole life means read the blog post and get more this website? It is really understandable and given notes to you. I have taken more time for making that post. Please tell me your thoughts and ideas about my post.